You could also call it the Universal Ski Crampon. With the option to mount it independently from the actual binding, the ION crampon can be used with any tech binding. Of course, if you use it with the ION it's even easier: just slide the included receptors under the toe pieces and screw them in. And with its unique corded attachment system, it can be installed or removed easily with one hand. In addition, demonstrating that G3 thought of everything, the crampon features a humped profile so your boot can drive it into the snow even while using your risers. Finally, it’s shiny. Comes in 85mm, 105mm, and 130mm widths to fit any ski. Universal mounting kit works with any tech binding / ski combination. Simple pull cord operates the attachment, which can be used with one hand. Raised rear profile helps your boot drive the points into the snow. Receptors that slide under the ION binding toe pieces included. Embossed 7075-T6 aluminum is strong and pleasing to the eye. Weighs just 135 grams (4.7 ounces) for the 105mm width. Mel, NO, Both these and the Fritschi crampons are very unique and wildly different from the Dynafit styles. will these work with g3 zeds? if so, will 105 work with DPS tour1 106's? Mark, They will work with the Zed. The 105 mm fit with about 1mm clearance on the DPS 106. Any idea if the 105 size would fit the Salomon QST 106? Hi Parker, I just took some measurements and while it will be close, I think you'll have enough clearance for it to work nicely. Is the G3 crampon compatible with the Kreuspitze telemark plate? I noticed that the the connections look very similar, and it would be super good luck if they could be mounted straight on to the telemark plate without the need for the G3 bracket. Do you have both to hand??? The reason for my interest in this idea apart from simplicity, weight saving and less hole drilling, is a desire to have the pivot point of the crampon as far forward as possible. The kreuspitze plate already takes up valuable space behind the binding toe, and I have concerns that using a dynafit style crampon mounted behind the plate will mean that the boot will not force the crampon down enough, especially on mid to high riser settings. 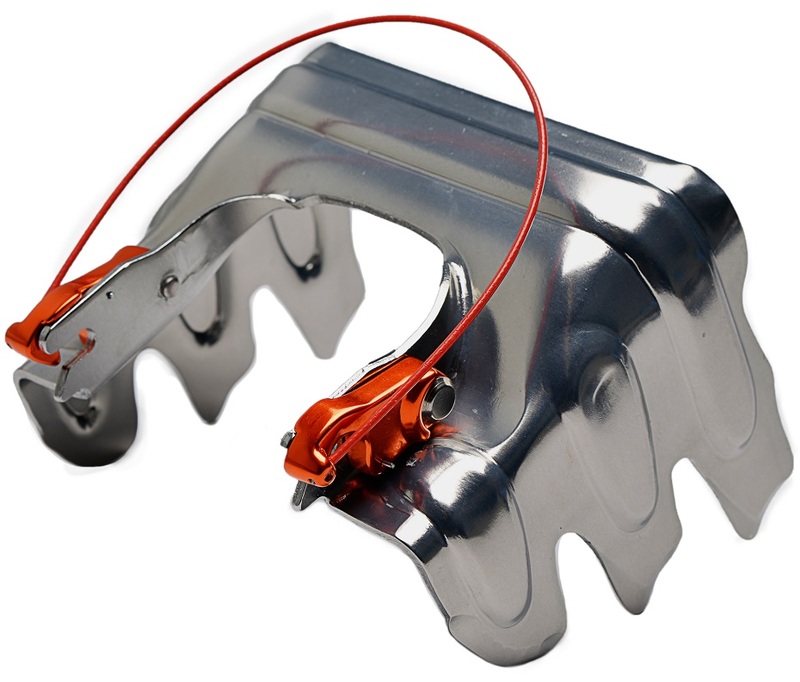 Can you offer any advice on the most suitable (effective) crampon system that would work with the kreuspitze telemark plate? Hi Rob, I gave it a shot to see if it would work, but it is not compatible. The Dynafit crampon mount would actually be further ahead on this system than the G3 would have been anyway. The Dynafit crampon attaches to the back of the toe piece. This is closer to the front of the binding system than the spring attachments where you were hoping the G3 would attach. I have ION LTs. Will these work ok with the new Scarpa F-1 boots? looking at the 105 mm crampon size for my Wailer 99s. Hi Raymond, yes they work no problem when used with ION bindings. The issue with different boots pops up with other bindings that have lower toe pins. Hey David, thanks for reaching out! I tested the crampon adapter on the Backland binding with a La Soprtiva Syborg Boot (race boot, the rubber tread isn't very tall) and wasn't able to get enough clearance for the boot to land on even the tallest riser without hitting the crampon mount. The Backland is designed to work with a Dynafit style crampon though, so that's definitely what I'd recommend. The highest Backland riser is TALL and the Syborg still didn't quite land on it with the crampon adapter underneath it. I love the concept. However be forewarned, the G3 adaptor does not fit all tech bindings. The crampon attachment prongs sat up so high it interfered with my TLT superlight / boot connection. Bummer, because I think it is a clever idea. I like the quick release design of these crampons. Much easier to use without stepping out of the binding and seem to come with no risk of accidentally releasing. They feel quite similar to my Dynafits as far bite goes. I have a question about the g3 ion ski crampon. My ski (FACTION ct3) is 108 at the waist. Is there a chance that the 105 will work form me or will I need to get the 130 for sure. Hi Steve, I don't have that ski to test, but there is roughly 4mm of wiggle room on these. It depends on how big your foot is since the further the toe moves from center the wider the crampon has to be. The 105s will be close on this setup, it might rub a little.